Notes: Bronze Age stone row and cairn, Assycombe. 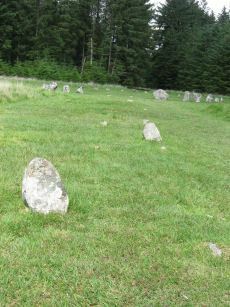 The double stone row is 120m long terminating in the cairn at the North-East end. The South-West end is blocked by a stone 2.0m high. The largest stone, 2m high, lies at the E end and was re-erected re-erected by Baring-Gould in 1892 or 1893. The cairn is 8.4m in diameter and 0.6m high. Notes: "Bronze Age stone row and cairn, Assycombe. 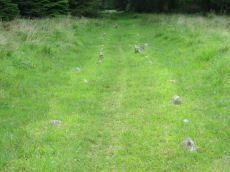 The double stone row is 120m long terminating in the cairn at the North-East end. The South-West end is blocked by a stone 2.0m high, re-erected there by Baring-Gould. The cairn is 8.4m in diameter and 0.6m high. Scheduled." Also from Burnard's 1892 field notes: The row, which starts from a ruined cairn, consists of 84 standing stones, and extends 800 feet E. and W., running in two rows down the hill towards Assycombe. 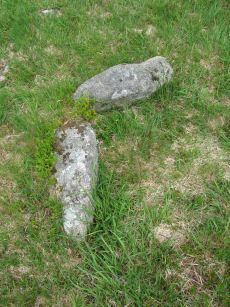 It terminates towards the W. in a stone lying prone, 5' 9" long. 2'' wide. The avenue is from 5' to 6' wide, inner measurement. The stones composing the row are 18" high, and down to 6". Notes: The cairn at the E end is in line with the N of the two rows. It measures 8.4m in diameter and is 0.6m high. 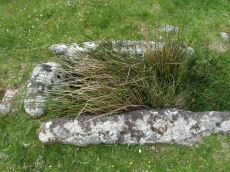 It contains a large quantity of stone; two stones in the centre, set at right angles to each other around a hollow, suggest the remains of a cist. Notes: "An enclosed settlement, maximum dimensions 300m NE/SW by 250m NW/SE, giving an area of 6ha. Enclosure cut through on SE by a leat, but wall still visible. Inside are 36 huts, and a further 3 outside. Condition of huts mainly poor. Average internal diameter is 3.7m: the largest is 13m by 10.5m, the smallest 2.5m. The enclosure wall appears contemporary with or later than the huts. The interior of the enclosure appears to have been cleared." Notes: Turner E14. "Remains of a cairn, visible as a turf covered stony mound. The NE quadrant is robbed out but around the rest of the periphery are parts of a kerb of small boulders, some set on edge, giving a diameter of 6.5m NW-SE. Maximum height 0.6m in the SW quadrant, but elsewhere the interior is badly robbed." Butler says there is a possible end slab of a cist. Notes: Turner E28. Dixon #73. Bar Rep. 57. Butler Chittaford Down 3 - Vol. 2. Map 27.18 (diagram Vol. 5. p.160). Grinsell LYDFORD 39. "A cist about 350 yards north of Archerton House. It has an irregular shape no coverstone and stands in the centre of a 14ft. diameter ruined cairn. There are traces of an enclosing ring of stones. Excavation in 1900 recovered wood charcoal and a worked flint flake from a small pit within the cist. Under the eastern side stone an archer's polished stone wrist guard was found". Lethbridge diagram and photo bottom p.112. 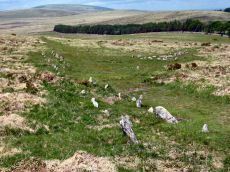 Notes: The Fernworthy circle is part of a group of ceremonial monuments including 3 stone rows and 5 cairns that may once have rivalled Merrivale and Shovel Down as ceremonial centres. The site is in a small clearing in Fernworthy Forrest off the path to Teignhead Farm. The circle is remarkably intact with all but 2 stones still in their original places ... It is 20m in diameter and consists of 27 small stones. The stone rows and cairns probably came later and surround the site. 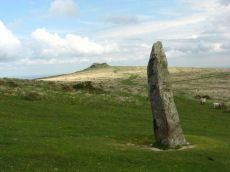 The circle was excavated by the Dartmoor Exploration Committee in 1897. They found that the interior of the circle was covered in a layer of charcoal suggesting that it had been the scene of very many fires - perhaps funeral pyres or feasts. See also Legendary Dartmoor: Dartmoor's Fernworthy Stone. DNP Post 3D. Notes: Dixon #97. Butler Vol. 2. Map 35.15.2 (diagram Vol. 5. p.36 - row 2). Grinsell LYDFORD 23. Newman Barrow B. 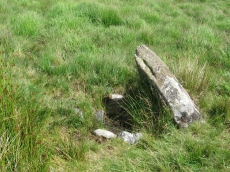 The remains of this cist are in the 6m diameter barrow at the N end of the Fernworthy S.E. stone row. The cist in the centre is represented by two stones set at right angles, 0.4m tall internally. Excavated by the Dartmoor Excavation Committee in 1898. A lot of burnt bone was found. DNP Post 6D. Notes: Turner F25. Newman Barrow A. 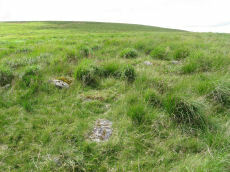 Small turf-covered cairn at the northern end of the western double stone row south of Fernworthy stone circle forming part of the Froggymead ceremonial complex. It measures 6.5 metres in diameter and has a central hollow resulting from excavation in 1898. 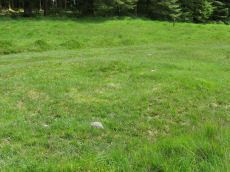 Two rings of orthostats, 7m and 5m diameter, around cairn 4.5m diameter and 0.2m high (Turner). It once had a retaining circle of small stones but only three were visible in 2013. DNP Post 2D. Notes: Newman Barrow C.Cairn forming part of the cermonial complex at Froggymeade. Sitated at the southern end of the eastern stone row to the south of Fernworthy stone circle. It was excavated in 1898 but had previously been disturbed. Only one small flint flake was found. Notes: Turner F4. Newman Barrow D. "5.8m diameter. Has 3 stones spaced on the east side. A beaker, flint knife, dress fastener and a piece of bronze were discovered when the cairn was excavated in 1898". The crushed beaker. When reconstructed it became one of Dartmoor's most important Bronze Age finds and is now on display in Plymouth City Museum along with the other artifacts retrieved. DNP Post 7D. Notes: Butler Row 2. "Centred at SX 65518404 is a cairn. 45m to the N at SX 65508409 is a barrow containing the remains of a cist. Between the two are the very fragmented remains of an alleged double stone row running N to S parallel to another row (SX 68 SE 59) which leads towards Fernworthy Stone Circle. The row, barrow and cairn have all been comprehensively damaged by afforestation and the digging of the adjacent drainage channels. Seven stones survive of an alignment but there is little evidence that it was a double row. The barrow at the N end of the row measures up to 6m in diameter and is 0.4m high, although its shape is obscured by drainage channels. The cist in the centre is represented by two stones set at right angles, 0.4m tall internally. 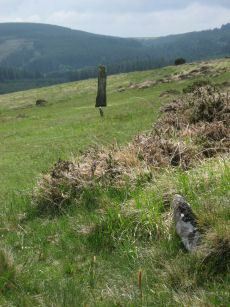 The cairn at the S end of the row measures 7.3m N to S by 8.5m and is 0.5m high. There is a large amount of surface stone on and around it." DNP Post 5D. Notes: Butler Row 3. "A disturbed double stone row is centred SX 65488408. It is 21m long and is oriented N to S. At the N end is a cairn (SX 68 SE 58) offset slightly W of the alignment of the row. Beyond this to the N is Fernworthy Stone Circle (SX 68 SE 56). The S end of the row is not very well preserved. The plan of 1898 depicts it terminating at a stone in the face of a wall, although the wall has since been removed. The stones in the row average 0.5m to 0.6m tall and lie in an area of amorphous modern earthworks up to 0.3m deep." DNP Post 1D. Notes: Turner E12. Next to Turner ring cairn D9. Grinsell Lydford 17b. 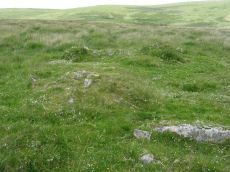 "Remains of a cairn 8.0 metres diameter and up to 0.2 metres high to the north of the hut settlement. 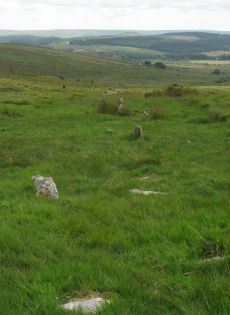 There are two pits cut into it, probably the result of work carried out by the Dartmoor Exploration Committee in 1901." DNP Site 9F. 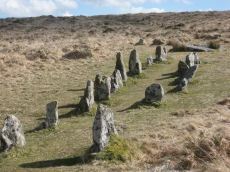 Notes: Hurston Ridge is one of the best examples of a double stone now on Dartmoor. At the south end is a cairn 22feet in diameter. The space between the rows widens intentionally as it approaches the cairn. The first stone from the south in the eastern row is the largest stone and stands 5 feet 10 inches high. Crossing suggests this may have been the original Heath Stone. A cinerary urn, in fragments except for the rim, was discovered in the cairn in 1900. Restored, the urn, 18 3/4 inches high, 16 inches in diameter at the rim and 8 inches in diameter at the base was revealed as an unusually large and handsome bipartite Overhanging rim or crowned urn of Middle Bronze Age type. Notes: .Worth: Watern Hill. "A stone alignment which includes two parallel lines of upright stones leading downslope for 143 metres from a round cairn. The lower end of the alignment is denoted by a blocking stone. Midway along the alignment a length of later enclosure walling crosses the row. The cairn at the upper end of the alignment measures 5.9 metres in diameter and stands up to a height of 0.6 metres. A large slab denoting the north eastern edge of the cairn may represent a second blocking stone of the associated alignment. 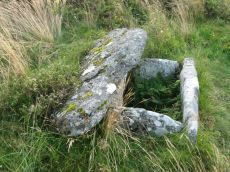 A cinerary urn was found in the cairn." A number of the stones were restored to their original sockets in 1894. 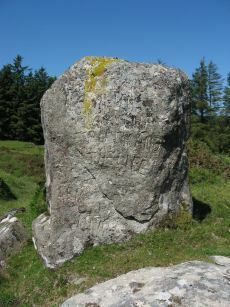 A broken hand axe was discovered in the pit in which one of the stones had stood near to the menhir next to the cairn. Notes: Situated at SX 67158129 on the rounded summit of Water Hill is the remains of a substantial round cairn 18.0 metres in diameter and up to 1.4 metres high in the east and 0.9 metres in the west. 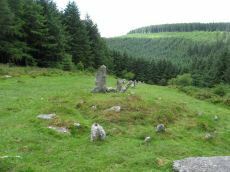 The whole of the central area of the cairn has been robbed to construct a superimposed modern boundary cairn 4.0 metres in diam and 2.1 metres high. This has given a 'dished' appearance to the cairn proper. 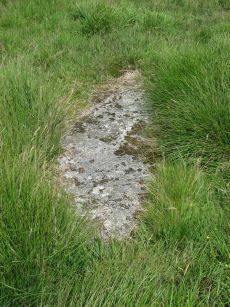 Several large slabs averging 0.8 metres by 0.7 metres scattered around the base of the boundary cairn may be the remains of a destroyed cist. The southern flat topped cairn measures 18 metres in diameter and 1.5 metres in height and is surmounted by a modern stone pile. A large slab situated to the south of this pile may have been part of a cist. Notes: Dixon #15. Bar Rep. 21. Butler Vol. 2. Map 27.4 (diagram of location p.41, diagram of site Vol. 5 p.22). Grinsell LYDFORD 40. One of the largest cists on Dartmoor. Discovered in August 1893 by Robert Burnard, who was responsible for the restoration of the grave. Lethbrdige diagram p.112, photo p.113. Notes: "The remains of an alleged stone circle lie on the gentle NE facing slope of Shovel Down 200m SW of Batworthy Corner. 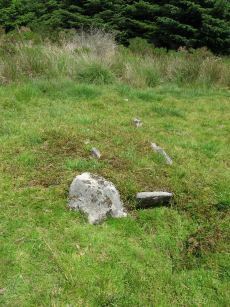 Three upright stones, between 0.3m and 0.75m high, are visible. The two close-set NE stones display smaller packing stones in the erosion hollows at their bases. The third stone is partly obscured by the bank of the South Hill Leat (SX 68 SW 97). 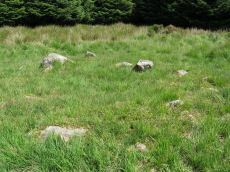 It is possible that these stones constitute the remains of a stone circle however, no such feature is noted in the antiquarian records so it must remain a doubtful site". For a photo, see Megalithic Portal: Shovel Down NW stone circle. Lethbridge pp.139-145, diagram p.139. Notes: Ceremonial complex including multiple stone rows and a small stone circle. Lethbridge pp.139-145. Notes: robbed cist no longer visible. Dixon #99. Butler Shoveldown Rows 4 Vol. 2. Map 36.7 (diagram Vol. 5. p.223). Grinsell CHAGFORD 1. The Shovel down double row C (Worth Row C, Butler Rows 4) terminates at its southern end in a cairn - the cist has been robbed from the cairn. Notes: Turner G31 - Multiple Stone Circle. "Fourfold Circle a sub-circular configuration of four apparently concentric stone rings. The outer ring has a diameter of 9m, the others have diameters of 6.4m, 4.7m and 2.4m respectively. 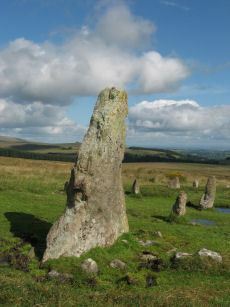 The monument comprises 29 visible stones. Most are approximately 0.3m in height although they vary from 0.1-0.55m. The middle two rings define the bottom and top of the scarp of a small earthern cairn apparently an integral part of the monument. It is most pronounced on the E (downslope side). In the centre is a roughly sub-circular pit measuring 1.3m by 0.7m and 0.45m deep; it is probably the remains of a badly robbed cist. 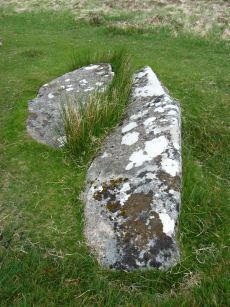 On the N side are two large fallen stones. When upright they may have served as a focal point for the end of the stone row " Lethbridge 139-145, diagram p.139. Notes: "The south end [of the double row] is aligned on a cairn 'Fourfold Circle' (SX 68 NE 17) and separated from it by two massive fallen stones, one 'needle-shaped' and similar to the 'Longstone' (SX 68 NE 39), southern terminal of stone row 'E'." Notes: Worth Row E, Butler Rows 3. ('A' SX 65898616 to SX 65938605). Double row to the west of row B. Length 476 ft. Rows just over 4 ft apart but distance varies considerably along length. No special feature marks either end. Much robbed and single now along much of its length. Lethbridge 139-145, diagram p.139. Notes: Worth Row A. Butler Rows 2. ('B' SX 65968615 to SX 65968601) Double row to the east. Length 596 ft. Rows 3 ft 6in apart. Row is near Batworthy enclosure and has been much robbed; now just 12 pairs of stones and 15 single. 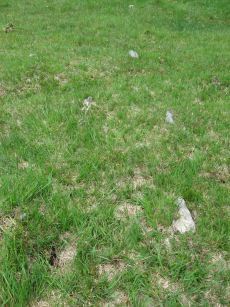 Spacing of stones along the rows is around 6 ft. Two fallen stones next to the circle are much the largest in the row; one is 11 ft 6in, in length. and the other 7ft 4 in. The southern end of the row terminates in the Fourfold Circle (SX 68 NE 17). Lethbridge 139-145, diagram p.139. Notes: Worth Row C, Butler Rows 4. "('C' SX 65948601 to SX 65998590) A double row, 380 feet long, with an average distance of five feet between the rows. Most of the pairs of stones are complete and the southern end terminates in a barrow (SX 68 NE 34). No special feature marks the northern end." Lethbridge 139-145, diagram p.139. "C: SX 65998592 to SX 65938602. 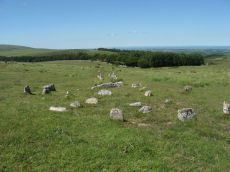 A double row (83 stones visible July '78), with minor breaks; at 40 metres from the northern end it is overlain and mutilated by a reave and later hollow-way. The row terminates at the southern end on a cairn with the remains of a cist (SX 68 NE 34). The apparent north-westward extension as a single stone row, is a denuded probable Bronze Age reave (SX 68 NE 63)." "D: SX 66028583 to SX 66048568. A single row (47 stones visible July '78) 149.0m long, with no terminal features; it curves slightly to the south west Worth (2) extends it as a reave for a further 50.0m to the north but this extension is straight, on a different alignment, and almost certainly a separate row (see G)." "G: SX 66008591 to SX 66028585. A single row (25 stones visible July '78), 60.0m long; two gaps (? stone robbing) of 6.0m & 8.0m occur towards the north end. 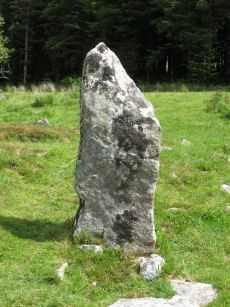 The north penultimate stone (now recumbent) is of much larger slab-like proportions and may have originally served as a blocking-stone." "H: SX 65998599 to SX 65998595. A single row (24 stones visible July '78), 51.0m long with three gaps of from 5.0m to 8.0m recorded by Pettit (3), but not Worth (2)." "J: SX 65978625 to SX 65988603. A single row (46 stones visible July '78), 228.0m long, there are no special terminal features. Many gaps of from 3.0m to 47.0m occur throughout the entire length of the row. The southern end has probably been overlain by a later reave (SX 68 NE 63). The northern end most probably extended further northward, and it would appear to have been destroyed by a mining 'rake' of circa 19th century date, and stone robbing? for the nearby Batworthy enclosure walls." ('E')SX 66028581 to SX 66028567) A double row, 485 feet long with 3 1/4 feet between the rows which run almost due north and south, and terminates in a standing stone known as the Longstone (SX 68 NE 39). Fairly complete at the northern end but more ragged towards the south. ('F' SX66028567 to SX 66038549) A double row continuing on almost the same alignment as ('E'), 555 feet long and terminating in a single standing stone, the sole survivor of the Three Boys (SX 68 NE 40). Only a few set stones survive but Ormerod (a) states that in 1858 the pits left by the removal of the other stones of the double row could still be seen. Notes: GID 1? Butler Shoveldown N.W.1. - Vol. 2. Map 37.5. (diagram Vol. 5. p.202). Grinsell GIDLEIGH 1 - Stonetor Hill(W). "The remains of a Bronze age cairn and cist which form part of a cairn cemetery on Long Ridge, known locally as Langridge, overlooking the valley of the River North Teign. 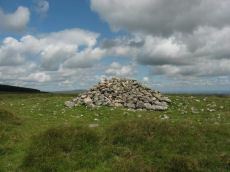 The cairn has a circular mound which measures 5.2 metres in diameter and 0.5 metres high. The cist measures 0.83 metres square by up to 0.47 metres deep. The capstone, which once covered the cist, now lies 0.7 metres NNW of the cist." Notes: Discovered by Alan Endacott in 2007 as described in Devon Archaeological Society Newsletter No. 117 January 2014. 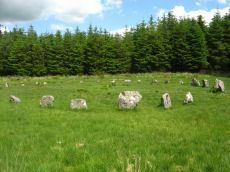 Circle consists of 30 recumbent stones and has a diameter of 32m. It is about 1km from the Grey Wethers which are to the ENE. 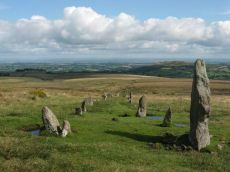 It is on the same arc as the previously known circles in northeastern Dartmoor. Notes: "An oval enclosure lying within Great Stannon Newtake. It is defined by a 4.5m wide and 1.2m high rubble bank surrounding an internal area measuring 53.5m east to west by 39m north to south. An 8.3 metre wide entrance gap on the eastern side by a stony mound. 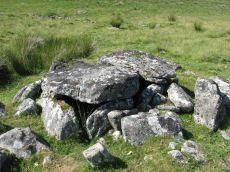 The considerable size of the bank combined with its proximity to a number of ritual monuments within Great Stannon Newtake strongly supports that this enclosure is much more likely to have been used for ritual than domestic purposes and it has consequently been identified as a henge." Notes: Turner D25. Butler Sittaford Tor S (Cairn 3) Vol. 2. Map 34.3 (p.112, also Butler Vol. 5. diagram p.183). 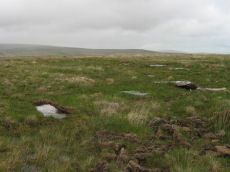 "This mutilated kerbed cairn is situated on a peat-covered moorland slope below Sittaford Tor at 488m OD. It measures about 5m in diameter and comprises a probably (hidden) central cist set within twin concentric kerbs of granite slabs." Lethbridge photo bottom p.125. Notes: Turner E4. oval cairn measuring 12.0m x 8.0m. It is flat-topped apart from a slight hollow in the centre. It appears to have multiple concentric rings of spaced small stones set on edge, with at least six rings being visible on its north side. To the south-east some stones are set at right angles to the rings. Butler in Volume 5 p.157 refers to a 14 x 6 m long cairn on the southern slopes of White Ridge. Presumably he refers to this site. Notes: Turner A5. A small circular 'pound' about 0.5km SE of Grey Wethers. It measures 75ft (N-S) by 66ft; the bank composed of small stone and earth is 6-8ft wide and 3ft high. An entrance on the W has one door jamb standing. Notes: Turner D16. Dixon #72. Bar Rep. 57. Butler Stannon Newtake E. - Vol. 2. Map 35.21 (diagram p.168). Grinsell LYDFORD 29. Notes: Possible extension of the White Ridge Stone Row. 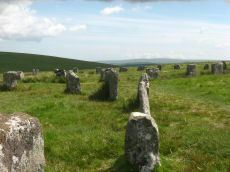 "Standing stones, possibly a stone row. Forty-six feet S. of the cairn (SX 68 SE 23) are two standing stones, two and a half feet high, their broad planes facing the monument. These, and two others in line, suggest the remains of a stone row, destroyed for materials for an ancient hedge. If a row, it does not point to the centre of the cairn. " Notes: Butler Vol. 2. Map 37.2 (diagram Vol 5 p.201). 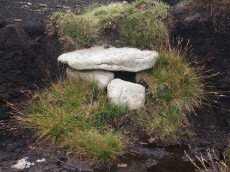 "A mutilated cist situated amongst peat cuttings on the moderate W slope of shovel Down. Only the N endstone, 0.6m long, remains in situ on the edge of a hollow 1.1m N-S by 0.9m and 0.2m deep. An irregular slab 0.15m thick, probably the disturbed coverstone, lies propped up on the endstone. There is no trace of a covering cairn". Lethbridge diagram p.133 and photo top p.133. Notes: Turner A3. Possible pound? "The feature consists of a sub-circular earthern bank 25m in diameter and up to 0.4m in height. It is best preserved on the North side where the bank is well defined, flat topped and has a plan width of about 4.0m On the South side the bank has been spread and flattened but still survives to 0.5m in height as a prominent outward-facing scarp, where the natural ground surface falls away from the enclsure. There is no entrance through the bank." Notes: Butler Vol. 2. Map 36.7. Grinsell CHAGFORD 2 (Shovel Down, E of Three Boys). Notes: "A double stone row, 620 ft in length from the centre of a cairn at the north end, running nearly due south and slightly downhill. Well preserved at the north end for a short distance but becoming more dilapidated as it approaches the newtake wall at the south end". Lethbridge diagram p.124 and photo top p.125. Notes: "Stone row in Yardworthy Newtake, an area of rough pasture that has since undergone some stone clearance. Apparently the remains of a double row it starts 3.0 metres from a low barrow at SX67608438 and extends to the north-east for 7.0 metres. 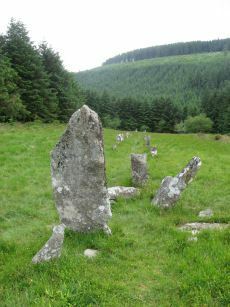 The north-west side consists of four stones, 2.0 to 2.5 metres apart. The south-eastern side about 1.4 metres distant has only one stone and two turf humps which may conceal others. Visible stones are barely 0.1 metres high. Immediately beyond the north-east end is a hollow or stone pit about 4.0 by 2.0 metres diameter. This, and clearance in the area may have destroyed any continuation."